I am just upset because I lost a very good stick today. I try to keep my temperament even while I slide my paws around the forest floor. Generally, I am quite good at this. I am resilient, at least outwardly, to the sometimes incredibly harsh ways of the forest and its often times challenging inhabitants. When squirrels make chuckling sounds I assume are directed at me, do I let out some angry roar as a response? No, of course not. Do I go back to my cave and steep myself into the sadness such chuckling causes me? Sure, but that is on my own time and in my own place. Nobody but me and the mood of my cave are affected by that kind behavior. When the deer across the river looks at me with his disgusting glances and makes ear piercing coughing sounds at me, do I let out an audible challenging response back? Well, sometimes, but that only affects the deer across the river and me. When birds wake me from a deep sleep, interrupting dreams of plastic bags filled with delicious sauces and dumpsters inside of clouds, do I shout at the birds? Of course not (except once and I am very sorry about that slip in character). I try to stay composed. I really do. I try to stay composed, especially, around others. Today, though, it was not so easy. I was irritable. I was rash. I made growling sounds at a tree I accidentally bumped into, sounds I had never heard myself make. I bit down on log I found. Like really hard. With anger. I do not usually do that, but today was an exception. I lost a stick this morning. This stick was no regular stick, though. It was a wonderful stick. I found it under a tree near my cave, sitting among some other forest debris. It would have gone unnoticed if I had not almost stepped on it. This stick was a perfect length. It had a lovely taste. It smelled like leaves. Good leaves. It fit into my mouth with such ease and without bits of its bark flaking off into the depths of my throat. I carried it off. I had no idea what to do with it, so I just walked around with it. It felt like I was taking it on a parade throughout the forest, letting every creature who would look know how proud I was of my beautiful stick. And then I set it down to take a drink of water from the river. And it was gone. At first, obviously, I blamed the deer across the river, but he was nowhere in sight. I ran around, stomping my paws loudly as I cried out for my stick! Nothing. 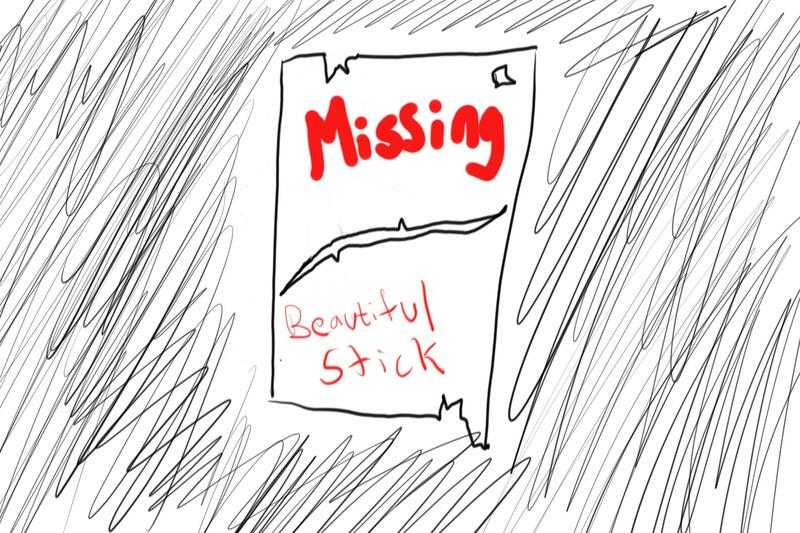 The stick never called back (as sticks never do). It was gone. Maybe some smart bird took it while I was drinking. Maybe the stick simply found a way to leave me. Maybe the forest floor took it and buried it someplace deep beneath the dirt. But that is why I was upset today. That was why I growled and seemed angry. Hopefully, it did not disturb anybody too much. Hopefully, that stick is still out there somewhere. This entry was posted in Bear thoughts and tagged bear blog, bears, conviction, etc, humor, nature, perfect stick, sticks, the forest, trees on February 27, 2017 by A bear.